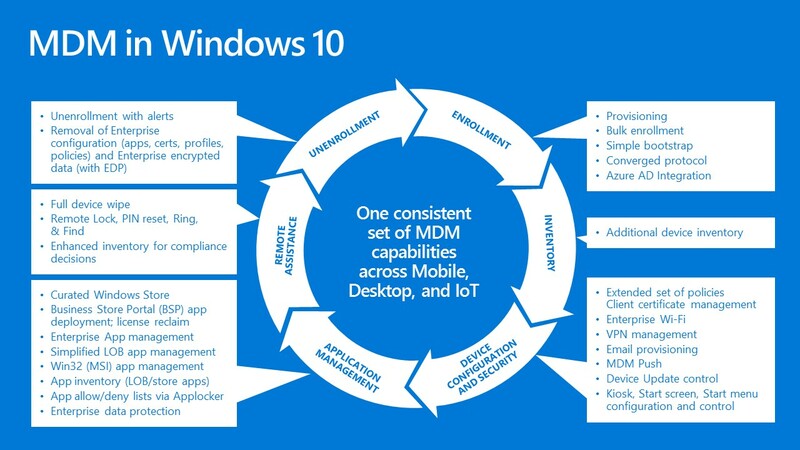 The MDM capabilities provided in Windows covers the complete lifecycle of the device. Enrollment capabilities to automate the MDM enrollment of the device as part of the Azure Active Directory join process. New controls for configuring and managing the Start menu. New controls over Windows updates, allowing you to control when specific Windows updates are deployed to MDM-managed devices (think “WSUS from the cloud”). New AppLocker and Enterprise Data Protection configuration settings. Integration with the Windows Store and the Business Store Portal (BSP) to enable automated app management. Full device wipe capabilities, even for PCs. These capabilities are supported on all types of devices, including Windows phone devices, PCs and tablets, and Internet-of-Things (IoT) devices.